In February this year the parkrun organisation reported that over 50s had run 2 million miles at UK parkruns in 2015. Their data show that parkrun is encouraging people over 50 to become more active, and it is helping people of all ages to start running. It was at Colwick parkrun in Nottingham that I first met Madeleine Wells, and got to know her and her family: husband Steve, son Mike, and grandsons James and Kieran. Madeleine was 60 when she started running. I was very pleased that she agreed to be interviewed, as I was curious to find out what prompted Madeleine to start running at 60, and what running means to her now. I interviewed Madeleine at her home in Nottingham on 31st March 2016. It took me a very long time to get as far as even thinking about running. It must have been around January/February 2012. The other couple decided it was too early on a Saturday morning so they weren’t going to bother any more. Steve and I thought we’d carry on as Mike was so enthusiastic and his boys were going. Over the weeks I increased my walking pace. Eventually I was walking as fast as I could and I thought, “Do you know what missus, if you picked your feet up it might actually be easier.” I was nearly always right at the back so I thought, “Well there’s nobody looking, I’ll just run a little bit.” So that’s what I did; I ran until I lost my breath after about 25 seconds and then I walked; and then as soon as I could pick my feet up again and run or jog, I ran a little bit more until eventually I was doing run/walk all the way round. So you’d built up your ability to run through doing the run/walking? Yes, that was a lightbulb moment for me. It then seemed easier to pick my feet up, because it was hard work walking really fast whereas jogging was actually easier. I’m always one for the least work possible for the most output. Had you done sport before? After that I was not interested in any way in sport. I really struggled to swim and once I went to senior school, the only sport we did was netball and hockey and I hated them. I hated the gym when you had to climb up bars. I hated all of it because I was lousy at it. The only thing I ever liked was when we did country dancing. Music makes me move. I love dancing but I don’t get very many opportunities to dance because Steve’s got two left feet. I’ve never been a sporty person, not interested in watching the football or the tennis, or taking part in any sport. I’ve got a huge admiration for people who can achieve anything sporty. Steve got the bowel cancer diagnosis in 2009. Towards the end of 2011, Sainsbury’s supermarket invited us to take part in a “Wells lifestyle fitness programme” for people with the surname Wells. I was interested because Steve was really struggling to recover from the cancer treatment; he was not a well man at all. It involved seeing a pharmacist once a month. They would take our blood pressure and our cholesterol, and talk to us about our lifestyle, including what we ate and how we slept. The incentive to participate was £50 a month in Sainsbury’s vouchers. We discovered that we were overweight, that our BMIs were really high and my blood pressure was high. Steve was only a little bit overweight, but I was very overweight at the time. I was nearly 11 stone and I went down to just over 9 stone in about a year. Seeing the pharmacist for a year and being really encouraged by them to do more exercise and eat more thoughtfully was the beginning of Steve getting better. This coincided with us starting parkrun. By the end of the year Steve was starting to feel really well. He was eventually given the all clear. Nobody would know he’s ever been ill now. Are you somewhat surprised that you’ve ended up running? Oh yes, because when I started parkrun I thought, “I’m never, ever going to run.” And then I started running and I thought, “Well, I’m never, ever going to do any events.” and then Mike persuaded me. “Why don’t you come and do the Gainsborough 10k?” And I said, “I can’t go that far.” “Yes you can!” And he entered me for my Christmas present. The race was in March 2014 and we were on a cruise in the December. It was a big ship that was half a kilometre all the way round so I kept running round the decks until I got up to 10k. I’ve just done the Gainsborough 10k for the third time. Every time I do it I think I’m an idiot for saying ‘yes please’, because beforehand you’ve got to really build up to go to 10k. I still really struggle with running. I don’t find it easy at all because basically I don’t practice very much because I like doing other things. 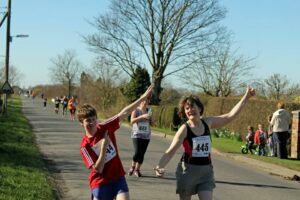 The other race I did (with Mike) a couple of times was Worksop, a 5-mile race, held in January. 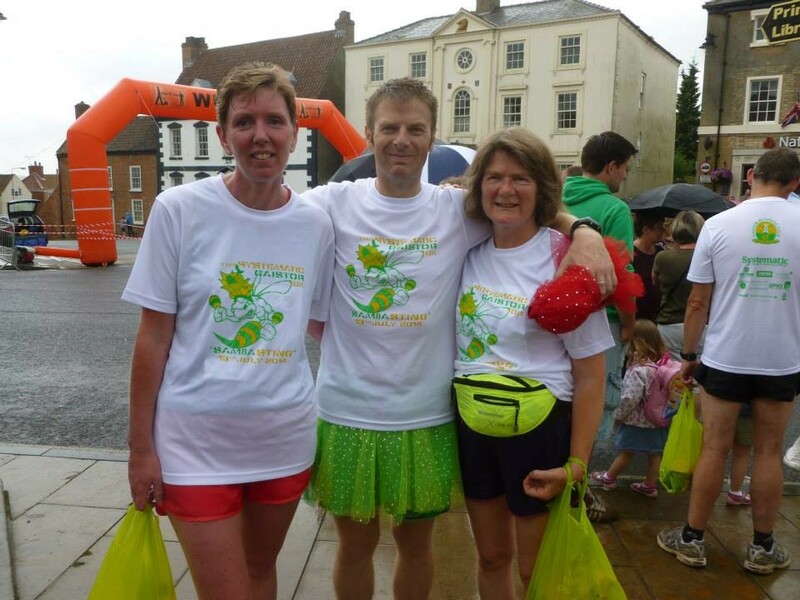 I really enjoyed that one, partly because my sister Lib came from Derbyshire to run it with us. The first time I did it I thought the hills were steep. The second time we did it I was really dreading them, but surprisingly they didn’t seem bad at all and that was pleasing. Did you feel you could see the improvement in your power as a runner? Yes, just being able to do it. I am encouraged by the feeling that I can do it better, but not enough to make me think I’m a runner. I’m not a runner. I’m someone who runs sometimes. I run because I love the company of the people I’m running with, rather than because I like running. So you aren’t motivated by wanting to do races? Not really. I’m not competitive at all. And that’s probably because as a child I always felt that I could never do anything so rather than compete I would not do it. Which other races have you done? I did the Chocolate 10k (Chocathon) in Derbyshire. For me it was incredibly steep but Mike was wonderful. He stayed with us and he was like a shepherd. When we got to steep bits, I was struggling and he just got behind me and put his hand on my back. He wasn’t pushing me, just letting me know I wouldn’t fall backwards. He kept me going. 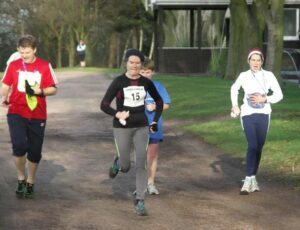 Another race we did was the Rotherham Resolution in early January. We only did it once. You could do either 6k or 12k. I enjoyed it because there were lots of other people using the park as well to say “Happy New Year” to. You started running for health and fitness but is it really the community and people that matter to you? That’s all it’s about really. But I am aware that I do need to get huffing and puffing kind of exercise. Mike’s my coach as well. He tells me off for things, “Pick your feet up!” One time he said to me, “You’re running in a very ‘girly’ way. You need to keep your elbows by your sides, not swing your arms from side to side.” When I managed that and learned how to run in a more relaxed way, I actually found I could run faster and stronger and I was thrilled by that. He does do his best in a very gentle, kind way to teach me to run a bit better. It really helps. Have you managed to avoid injuries? I did tear a muscle in my calf but at first I didn’t know that’s what I’d done. Eventually I went to Mr. Bendy, the sports injury man. He’s really, really good. He gave me a set of exercises to do and some ultrasound, and fixed me within a very short time. One time I’d got to that point near the finish at Colwick parkrun and I tripped over the tree roots. Without thinking I just rolled over and got up and carried on. There were women running behind me and they asked me if I was OK and then stayed behind me. I really appreciated that they didn’t just run past. It felt very supportive. They guided me in and it was a really nice experience. I do fall over. I’ve usually got a scar on one of my knees. The last time was when I ran early in the morning on Christmas Day. I looked over my shoulder and ended up face down. I’ve still got the mark on my knee and that reminds me to be more careful. I just get up and keep going. Running is so good for bone strength and for your heart as well. Has anything got in the way of your running? No, only my willpower and my desire to do other things. If the sun’s shining like it is today something in me says, “You could go for a run.” but then I think actually I could be in the garden. And I would much rather be gardening. I get lost in the garden in my head and I like that, whereas other people get lost in their head with running. But I don’t run to get lost in my head. I run to be with people and to be in beautiful places. I’m probably going to do my 100th parkrun at the end of April. We go to parkrun whenever we can, about every other week. Other than that I have tended to run once or twice a week as well. I’ve found lately that if I don’t go for a run in the morning, it feels too late by the time it gets past the middle of the afternoon. My Dad used to say, “I’ve come to the end of my lollipop.” I now understand what he meant. I just run out of steam. So fitting running in is a challenge? It’s got to be at the right time, when I’ve got enough energy. Although I’m retired my life is so full there are lots of other things that take up time. It’s just another brilliant part of being one of the very lucky generation to be a woman alive now. I think it’s incredible the difference between what we’ve been able to access and what my mother’s generation could access. Do you think running is going to carry on being part of what you do? I very much want it to be. I want to get into running with the Woodthorpe Huffers and Puffers. There are running groups around which is wonderful and I want to be part of that. Running is important to me because it makes you feel much happier somehow. If I’m on my own I find it really difficult, but I always know once I get out and go by the time I get home I’ll feel much better. Have you got any more races planned this year? Steve has had one hip fixed and the other hip is dicky so there really isn’t any way that he can ever be part of running races. For me it’s really important to do things together as much as we possibly can, so I don’t want to spend too much time doing things that he’s excluded from. parkrun’s good because if his legs feel OK he can walk it and if they don’t he can volunteer. It’s wonderful that it includes us both. Do you think you might ever run further than 10k? I don’t think I really want to. 10k is challenging for me though I know I can do it. But there is more of a challenge finding the time to prepare. It is a measure of being as well as I can. I want to age as “gracefully” as I can. I don’t want to slip into old age and be a useless old woman. Running is helping me to stay healthier and happier too. I think it’s possible that if Mike hadn’t introduced us to parkrun my health could have done what it tends to do as you go past 60 – just gradually go downhill – and I don’t feel as though it has, so I think it’s kept me well and that’s why I want to carry on with it. Would you say there’s anyone who particularly inspires you? There are lots of people. Karen Parkin really inspires me. I think she’s amazing, so encouraging and friendly. Mike does, on a daily basis. Lib, my sister does, especially as she’s a vegan on the “paleo” side of vegan. She’s 4 years younger than me but she’s over 60 now. She’s still running and getting new PBs. Mike’s (fiancée) Sarah does. When they first met neither of them were runners. She always said, “Oh I’m not running”, then she said “No, I’m not doing more than 5k” and so on, and now she’s training for an ultra. When Mike started running, he read the book “Born to Run”. We got the CDs and listened to it travelling back and forth to Scotland. It really spoke to me. I think it’s an amazing book, really inspiring. There are so many sources of inspiration. And what’s really nice as well was that I discovered not long before my Dad died, that when he was a young man in the army, he ran hell for leather everywhere. If he was given an order to do something he would run it. Maybe that’s why my Dad lived so long because he did so much running. He was very skinny and very busy most of his life. He wasn’t a runner in the sense that he “did” running, he just naturally ran everywhere. So there’s a connection to my Dad. And he and Mike absolutely adored each other even though when our children were small we didn’t see a lot of my Mum and Dad. It’s not just the physical side of running, it’s much, much more than that. Those connections across generations, across emotions, across philosophies, and ways of life. Thank you Madeleine for sharing your story with me. “Born to Run: The Hidden Tribe, the Ultra-Runners, and the Greatest Race the World Has Never Seen” by Christopher McDougall, April 2010. Well done Katie another fab interview Madelaine’s story is so positive and she has come a very long way with her running and as she said she wanted to she is now running with The Huffers and Puffers on a mon night and most welcome ! Keep up the good work Madelaine always smiling and welcoming to others ! What a brilliant interview. So honest. “Sometimes I’d rather be in the garden” …too right. 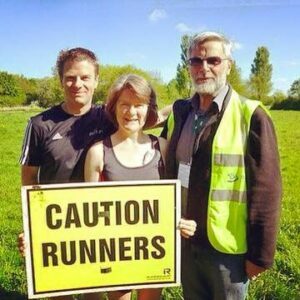 Great interview with Mrs W. As a fan of parkrun, it was particularly pleasing to see that this is where Madeleine started running. 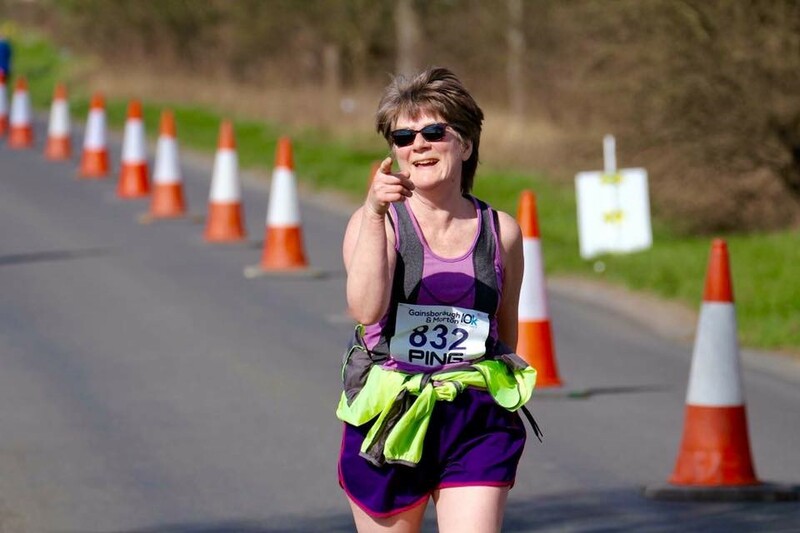 As someone who started running at 48 (and am now 52) I’m particularly interested in blogs like yours – encouraging we more mature folk to keep it up. I’ve added this to my favourites and will also link to it from my blog. (Mine’s only really of interest to friends, but the people who read mine will certainly be interested in yours). Keep up the good work.